This tutorial provides you with a foundation for working with Adobe Premiere Pro media. It is the second lesson in the Adobe Premiere Pro CS5 Digital Classroom book. For more Adobe Premiere Pro training options, visit AGI’s Premiere Pro Classes. Media Management is the organization or management of the media you work with in a project. There are two equally important aspects to Media Management. The first is how you manage the media on your hard drives, and the second is how you organize the different media references that you import into Premiere Pro. To ensure portability, performance, and security, we highly recommend that you store media on an external hard disk drive. The two standard connection types for external hard drives are FireWire (400 and 800) and USB 2.0. Most video editors recommend a FireWire drive because of its higher sustained bus speed, but any type of drive works for your projects. The files that you will work with to complete the lessons in this book are organized into a single folder called Media Library. Within that folder, there are additional folders for each individual project. In each respective project folder, there are folders that separate the different types of media (video, audio, and still images) you will use. This type of hierarchical structure is also used to keep the project panel organized and makes it easier to locate the media you want to add to the Timeline panel. Before you can edit any piece of footage, you must first add it to your Premiere Pro project. You can import a wide variety of media, including video, audio, still images, After Effects Projects, and other Premiere Pro projects. In this section, you will import a variety of media files into your project that you can later organize and add to your Timeline. 1 With the pr0201-working file still open, confirm that you are using the Digital Classroom-Editing workspace that you created earlier in this lesson. If you have made any changes to the workspace, you can reset it now. 2 Choose File > Import to open the Import dialog box, then navigate to the Media Library folder located in the prlessons folder that you copied to your hard drive. 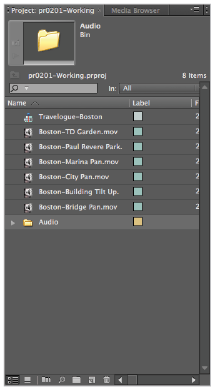 Select the Travelogue-Boston folder, and then click the Video subfolder to select it and reveal the video files you will import for this lesson. 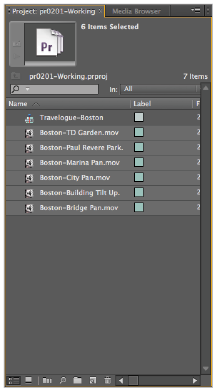 3 Inside the Video folder, there are six video files shot in the city of Boston: Boston-Bridge Pan.mov, Boston-Building Tilt Up.mov, Boston-City Pan.mov, Boston-Marina Pan.mov, Boston-Paul Revere Park.mov, and Boston-TD Garden. Click the first video file in the dialog box, hold the Shift key on your keyboard, and then click the last file to select every file between them. Click the Open button to import all the selected files into your project panel. selected in the project panel. Holding the Shift key while selecting files only selects files in a sequential list. To select files non-sequentially, hold the Control (Windows) or Command (MacOS) key and click individual files. 4 In addition to importing individual or groups of files, you can import entire folders and their content. 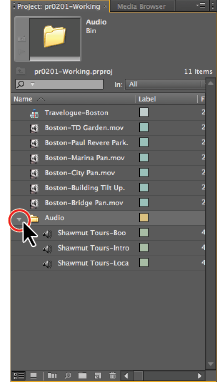 Choose File > Import, and in the Import dialog box, click the Audio folder inside the Travelogue-Boston folder. With the Audio folder selected, click the Import Folder button. When you import a folder into Premiere Pro, the application creates a bin in the Project panel with the same name as the imported folder. The content of the folder on your hard drives, as well as the content of any sub-folders, is placed inside this bin. 5 Click the reveal triangle to the left of the Audio bins name to show the clips that you imported. and hide the bin’s contents. 6 Choose File > Save or press Control + S (Windows) or Command + S (MacOS) to save the project file. In the next part of the lesson, you will create a new bin to hold the video files you just imported and keep the project panel organized.